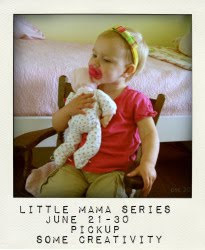 Part two of my Little Mama Series: Doll crib bumpers. Helpful to have: rotary cutter and quilting ruler. Step one. Measure and cut your material. Two (2) 25" by 9" rectangles for the long sides of the crib. Two (2) 13" by 9" rectangles for the short sides of the crib. Two (2) 24" by 4" rectangles of cotton batting. Two (2) 12" by 4" rectangles of cotton batting. Two (2) 36" by 4" rectangles of cotton batting. Eight (8) 10" lengths of ribbon for ties. If I were making a full size set of bumpers, I'd double the ties. Since this was for a small scale, I figured one set in each corner would be sufficient. Step Two. Sew the rectangles together with the ties. Open up the rectangles after ironing, and pin the ribbon ties in place. If you are making full-size, you'll want two ties at each top and bottom corner. (One 1/2" up from iron mark, one down 1/2" from the top.) For the dolly size, I basted the ties at the center (or quarter with everything opened up). Baste the ribbons in place. Pin together each short end, alternating the long length pieces and the short end pieces. Sew the four lengths together with three seams, using a 1/2" seam. There will be a set of ties which is not in a seam. Step three. Quilt the batting to the fabric. There are two sets of batting. The first set are the four pieces that are the size of the crib. These will be quilted to one side of the bumpers. They are cut so they fit nicely into the corners. The other set are longer. They are to provide stability, and aren't cut to fit corners. Carefully pin the first set of batting into place. Using a long ruler and a pencil or quilting marker, draw the sewing lines to follow. Mine are 1" apart. Repeat for the other three sides of the bumpers. Prepare the long set of batting. First, sew the two pieces together with a zigzag stitch. I only sewed the batting into the corner seams. This allowed the batting to still fold into the corners, but gave the first set of batting some more strength. Repeat for the remaining three corners. Step four. Baste the ricrac in place. With the right side up, baste the ricrac 1/2" down from the top of the bumpers. I chose the quilted side to be the outside of the bumpers, and that is where I basted the ricrac. Step five. Sew the bumpers together. First, pin the ribbons together so they are out of your way. With right sides together, carefully pin the bumpers together. Sew together using a 1/2" seam. Be sure to leave one short side open for turning. Turn the bumpers right side out. This is tricky...like wrangling a snake. It would be easier with wider bumpers. Step six. Topstitching and velcro closure. You're ready to topstitch the bumpers. You'll want to stitch that opening closed, as well as along the top and bottom of the bumpers. As you sew along the ricrac side, if any ricrac is sticking out too far, your can pull the fabric up over it as you go. Don't forget to topstitch along the bottom, too. Cut a length of velcro to match the width of your bumpers. Sew the velcro to the bumpers, the loop side on one edge, the hook on the other edge, making sure the edge with the ties is the edge that is towards the outside. Carefully sew along the edge, just like topstitching. Step seven. Velcro tabs for the sides. This is an additional step I added after realizing a few days after I completed the bumpers that the sides sagged. So, grab your pins and decide based on your crib spindles where you need additional support. I figured two tabs per side for my little crib. Cut two 8" by 2.5" rectangles of fabric. Sew them, right sides together, then turn and press. Top stitch the tabs along all sides. Cut four velcro pieces to fit each tab on one end. Sew the velcro in place on one end, and then sew the tab on to the bumper using the same size rectangle stitch so that they match. Sew the other part of the velcro in place on the bumper. Repeat for other three tabs. Your dolly crib is really looking like the real thing. The best part about these bumpers is you can personalize them in a million ways. Use piping instead of ricrac. You could piece together the outside, just make sure the final piece is the same dimensions as the inner piece. You could use twill tape or make your own ties with fabric instead of ribbon. I would love to see what you come up with! Now for the love note to my daughters. One thing I've realized is that everything I've done in my life helped prepare me for motherhood. I remember expecting my first son, and the fun I had in preparing his nursery...including his bumpers. In a way, doing all that work in preparing for my son's birth was symbolic of all the preparation I had received. I've been so blessed to receive a great college education, including an advanced degree. Before Mr. Pickup and I married, I had the chance to study abroad, to work full-time, and to even be a missionary for my church. I rely on all of this experience each day as I mother my children. That is the message I want to share with my daughters. To be a good mother takes preparation...education, life skills, and emotional maturity are essential. I hope that they will seek higher education, and as many wonderful experiences as they can. It is important to be prepared for whatever may come, and in the end it will help them to be better moms. Linked up to A Few of My Favorite Things, KoJo Designs, Those Northern Skies, Tatertots and Jello, Along for the Ride, and Creative Jewish Mom. Your bumper is amazing, and the tutorial was very easy to follow! How nice that you could reuse the same fabric that your mother used for your daughter. This is bringing back my own childhood memories. My mother made me a little doll crib when I was a child. 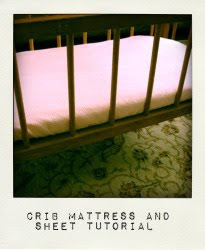 While she didn't make a bumper, she did sew a cover for a crib mattress in a cute Strawberry Shortcake print. I think she still has it in a closet in her home, and I'm going to make sure she doesn't throw it away! Hopefully I'll have a daughter someday and I can use it then. I can only imagine how much your daughters will enjoy this! So cute! I've been looking for a little doll crib at garage sales and thrift stores. Now I REALLY want to find one . . . like NOW! Such a great tutorial! Thanks for posting on Favorite Things Friday! Well done tutorial... so detailed!!!! And I loved reading your thoughts about motherhood. I agree with everything you said! Beautiful. AAAaaannnndddd... that photo of your daughter asleep in the doll crib (on an earlier post)... precious!!! Awesome, as usual. And I agree, that picture of her asleep in it, too sweet. Now I just need to get my daughter a crib so I can make the sheets and the bumper...so cute. You make it look so easy, too! I'm off to a garage sale to see what I can find. Thanks for the inspiration. 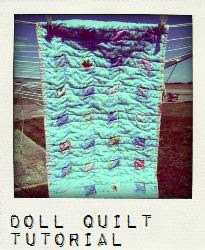 I have some doll cribs that are seriously in need of bedding. Maybe this will inspire me to get my but in gear. I just found your blog and love it! I just wanted to say I'm glad your name is Chris... and not Elvis. When I first read your signature at the end of the post I thought it said Elvis. Under closer inspection it obviously says Chris. 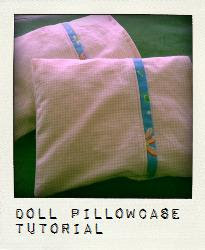 Actually I really started this comment because I love all the tutorials your doing on doll cribs. I also love the picture (a couple posts down) of your daughter sleeping in the doll crib! Too cute! great tutorial! Thanks so very much for your participation in Craft Schooling Sunday, I really appreciate it and all your wonderful projects! Keep up the good work! Yay! That's really cute and would be one of the perfect baby gifts to give. Great job! Anyway, I wonder if we can also use this doll crib bumper on baby's cradle?